Peggy Noonan makes a great observation in her column, “America is so in play” that has escaped others in the media, the political establishments and the voter population. She should have spent more time on the point about her “acquaintance, late 60s, northern Georgia, lives on Social Security, voted Obama in ’08, not partisan, watches Fox News, hates Wall Street and “the GOP establishment” … so ardent for Mr. Trump.” For someone to be a supporter of Obama and Trump is a contradiction. That is an example of a confused electorate. I have said for a long time there were people in this country who voted for Reagan and Obama, I’ll bet this lady is one. THIS IS THE REASON WE CANT GET THE MARXISTS OUT OF POWER, THE MEDIA TO BE RESPONSIBLE, OR THE REP PARTY POWER ELITES TO PAY ATTENTION. Donald Trump’s staying power in the polls reflects a change in the electorate only now coming into focus. So, more thoughts on Donald Trump’s candidacy, because I can’t stop being fascinated. You know the latest numbers. Quinnipiac University’s poll this week has Mr. Trump at a hefty 28% nationally, up from 20% in July. Public Policy Polling has Mr. Trump leading all Republicans in New Hampshire with 35%. A Monmouth University poll has him at 30% in South Carolina, followed 15 points later by Ben Carson. Since Mr. Trump announced, I’ve worked or traveled in, among other places, Southern California, Connecticut, Georgia, Virginia, New Jersey and New York’s Long Island. In all places I just talked to people. My biggest sense is that political professionals are going to have to rethink “the base,” reimagine it when they see it in their minds. “He’s the man,” Cesar said of Mr. Trump. 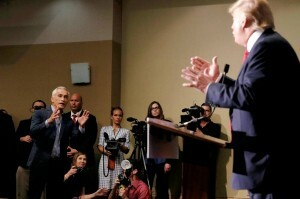 This week I went by and Cesar told me that after Mr. Trump threw Univision’s well-known anchor and immigration activist, Jorge Ramos, out of an Iowa news conference on Tuesday evening, the “El Vacilón” hosts again threw open the phone lines the following morning and were again surprised that the majority of callers backed not Mr. Ramos but Mr. Trump. Cesar, who I should probably note sees me, I sense, as a very nice establishment person who needs to get with the new reality, was delighted. America is so in play. And: “the base” isn’t the limited, clichéd thing it once was, it’s becoming a big, broad jumble that few understand. Mr. Trump is not .. limited to the GOP base. [The elites] don’t like what they see. They sometimes refer to “Jaywalking,” the old Jay Leno “Tonight Show” staple in which he walked outside the studio and asked the man on the street about history. What caused the American Civil War? Um, Hitler? When did it take place, roughly? Uh, 1958?